An interesting game with an attractive set of bonus features. The high variance of the slot and the features can produce some big payouts during base play and in the bonus rounds. Vegas Nights is a video slot inspired by the city which never sleeps. You will get to play some of the best casino games Vegas has to offer and enjoy the company of beautiful hostesses while you spin the reels. To top it all off, with some luck on your side, you can leave with a big stack of chips from the table and enjoy some of the best shows in Vegas. When you first open the game you will see that the Pragmatic Play designers worked hard to give this slot an appealing look. The symbols in the game are well designed with a vibrant choice of colors and modern animations. As you spin the reels you will enjoy the background sounds which give you the illusion that you are playing in a real live casino. 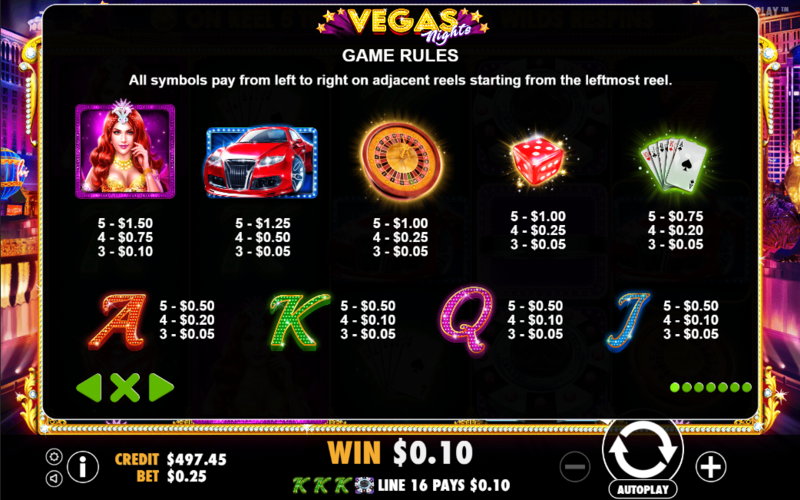 For this slot the designers went with a 25 payline design. Winning combinations are formed across the 5 reels and 3 rows, starting from left to right. Since this is a high variance slot you will need a bigger starting balance in order to maximize your chances of hitting the bonus round and getting a big payout. But thanks to the stacked Wild on reels 2, 3 and 4 you can get some nice payouts even during the base play. The bet size in Vegas Nights can range from $0.25 up to $125 per spin. It can be adjusted by the coin value between 0.01 and 0.50 and the number of coins per line from 1 to 10. Autoplay option offers up to 100 spins. Vegas Nights is a video slot with an RTP value of 96.05%. Don’t expect to see frequent winnings on the reels of this slot, but you can expect big payouts in the bonus features. The Black Poker Chip is the Wild symbol in the game and it can land on reels 2, 3 and 4 only, substituting for all other game symbols except the Scatter and the Super Wild symbol. The Super Wild symbol can land only on reel 5 and once it lands at the central position the Wilds Respin Feature is triggered. 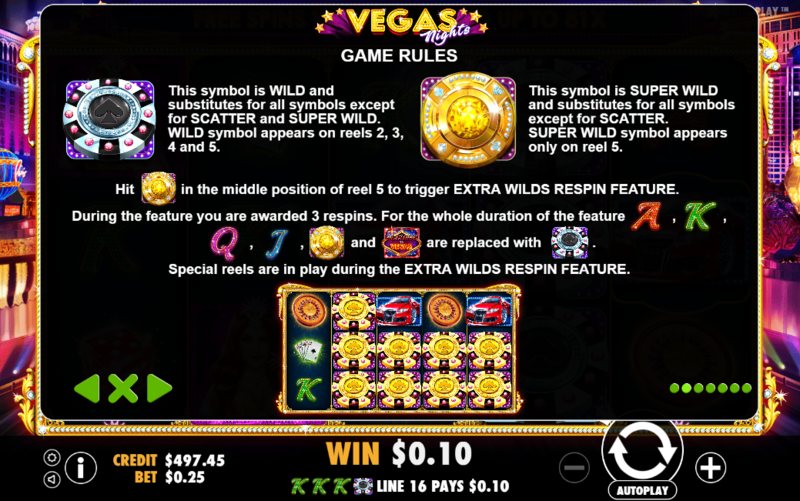 The player will get 3 Wild Respins where all J, Q, K, A, Scatter and Super Wild symbols will be transformed to Wild symbols. 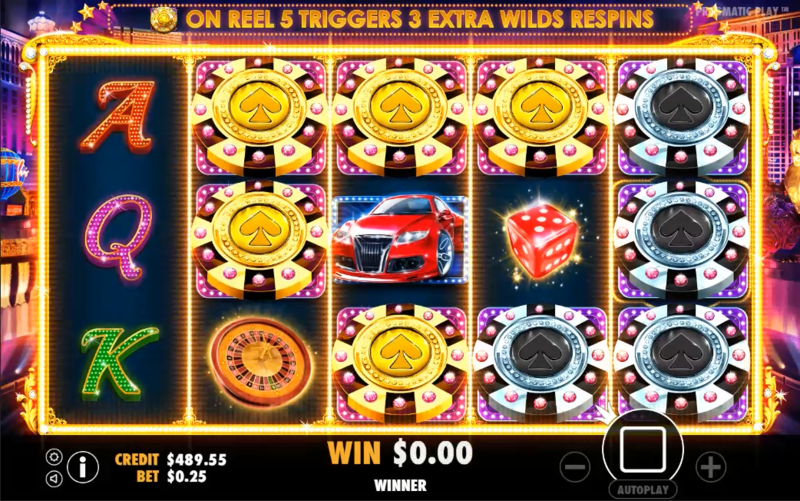 The scatter symbol can land on reels 2, 3 and 4 only, triggering the free spins bonus. The player is awarded with 5 free spins where all Wild and Super Wild symbols have a x2 or x3 multiplier attached. The bonus can be re-triggered by landing another set of 3 Scatters on the reels. Vegas Nights is an attractive video slot. The visual details in the game are on a high level with modern animations and vibrant choice of colors. 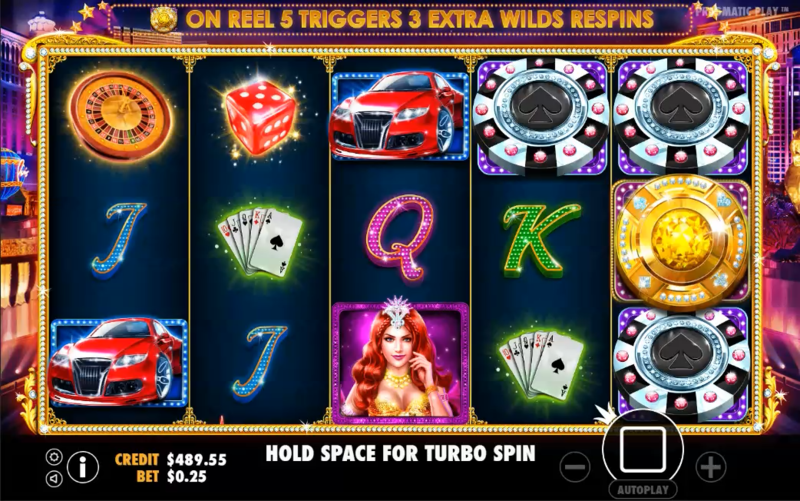 The gameplay is fast, with a hip background music which makes the slot fun to play. The bonus features in the game can be lucrative, especially if you manage to get a full stack of wilds on reels 2, 3 and 4. The free spins bonus can award some big payouts thanks to the x2 and x3 multipliers attached to the Wild symbols.